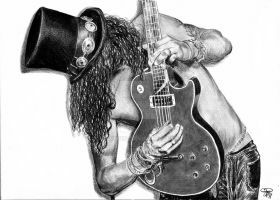 this is not what i wxpected when i searched for slash, but i like it anyeay! im a big an of tophats! Wow. Just.... wow. I'm speechless, that's awesome! It's amazing ! I love this ! This is astonishing! I wish that one day be as good as you are. I am just in awe , that is what a drawing should be . Wow! Amazing work! The lines and shading is very smooth. Great job! 6 grandee! adoro i guns!